If your lead synth lines are more weedy than they are wailing, you've come to the right place. We're going to show you how to create a beefy high-end patch that will scream from your speakers and leave your listeners reeling. Step 1: The first step is to build a basic patch. 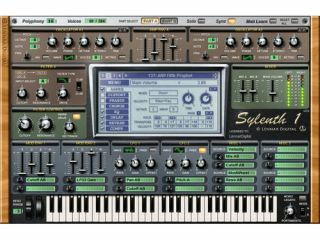 We're using the phenomenal Lennar Digital Sylenth1 (but any decent analogue synth plug-in will do) to create something that will give us a good starting point. As you can see, we've selected QPulse for Oscillator 1 and a generic pulse wave for Oscillator 2. Step 2: Time for a bit of routing: we want our mod wheel to control the pitch modulation (pushing the boat out here, we know! ), so we set up an LFO to do it. Here, LFO 2 is doing just that, while in the Misc 1 panel, the ModWheel is governing the LFO2 Gain. Step 3: We have quite a viable sound now - although it's a little bell-like. Let's play our part in. We've gone for a slow, lilting and emotional riff that would suit an epic trance or film piece. Some judicious pitchbends don't hurt either - you can set the range easily. Step 4: One final bit of synth programming before we move onto effects: let's use a second LFO to do a bit of crazy pitch modulation at one point in the riff. Here, LFO 1 is set up with the QPulse wave, all ready to adapt the global pitch. We can automate this on one particular note to create a weird, blippy swooping effect. Step 5: Our basic sound is in place, so let's load some effects. Set up a simple ping-pong delay and a hall reverb on auxiliary sends. Sends make everything easier in certain circumstances, particularly for generic effects: we can also use the same reverb on other sounds to create a consistent sonic atmosphere. Step 6: We're now ready to inflate this sound somewhat! For a handy bit-reduction trick, put a touch of reverb in your signal chain before the crushing kicks in. This creates a nasty, clanging, grainy sound that you can manipulate to your heart's content! We can now take this metallic tone and amplify it even further. Step 7: Here's the big one: a healthy slab of overdrive from Ableton Live's Saturator. With this and Live's Redux, we've got a very unusual, sharp sound that's sitting nicely in some reverb and delay. This won't suit every track, but it's certainly powerful. Distortion is a great tool for beefing things up in the right context. Step 8: Finally, we add a high-pass Auto Filter before the Saturator. This is great for wah-like sweeps. Placing a filter before a distortion unit is a classic sound engineering technique: the high gain accentuates the frequencies that the filter leaves behind. This works really well for drum 'n' bass basslines, too.